on Sunday, November 26, 2017, when, at the ripe young age of 70, I recorded my first true double on a pair of ringneck pheasants. I've shot a few one rise/right barrel, second rise/left barrel, but this is my first verifiable both-birds-in-the-air-at-once double, that I can recall anyway. I have to admit I'm kinda stoked! Congrats! A special moment for sure. 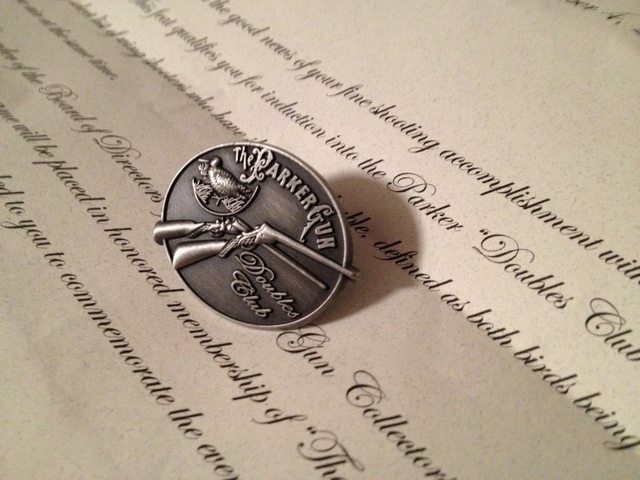 Cool doubles pin. I'd be stoked as well, good job! I know Orvis used to have those pins, did not know there were others. Did your dog clap? . Nice shooting! Didn't know there is such a award. Good for you! Getting better with age, like fine wine! Good shooting, I am happy for you. Congratulations, that’s a neat accomplishment. I did it once with a 20 ga, sxs. And I’ve got two with one shot, twice, one 12 ga and one 16 ga. In both of those cases I did not even see the second bird until it fell. Congrats, very nice accomplishment. I would probably be so excited I would shoot between them and miss both. I really like the pin and letter. That's very cool, needs a frame I think. Ah shucks, guys! Thanks for all the kind words; much appreciated.